This chapter looks in more detail at some of the properties of the orange patch described in Constructing a thin 4.5.20 tiling. 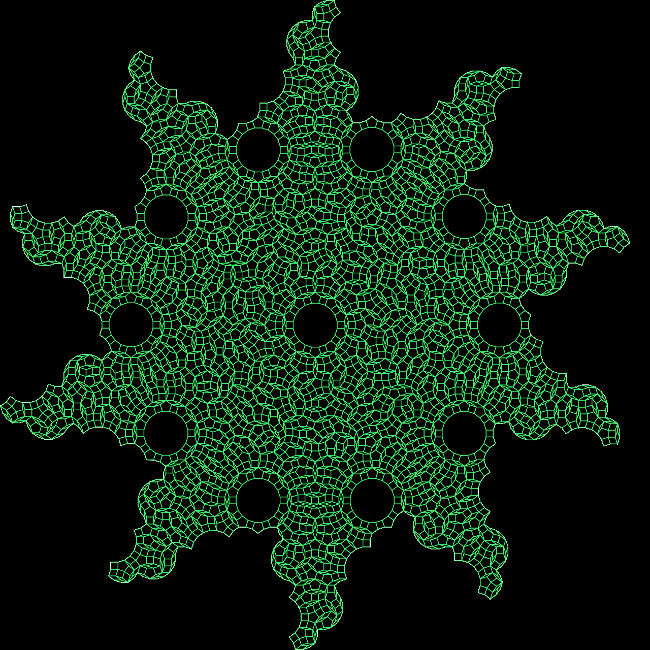 Ten copies of the thin rhomb (10-rhomb) can be centred on a single vertex. The patch described in this section has a similar property. 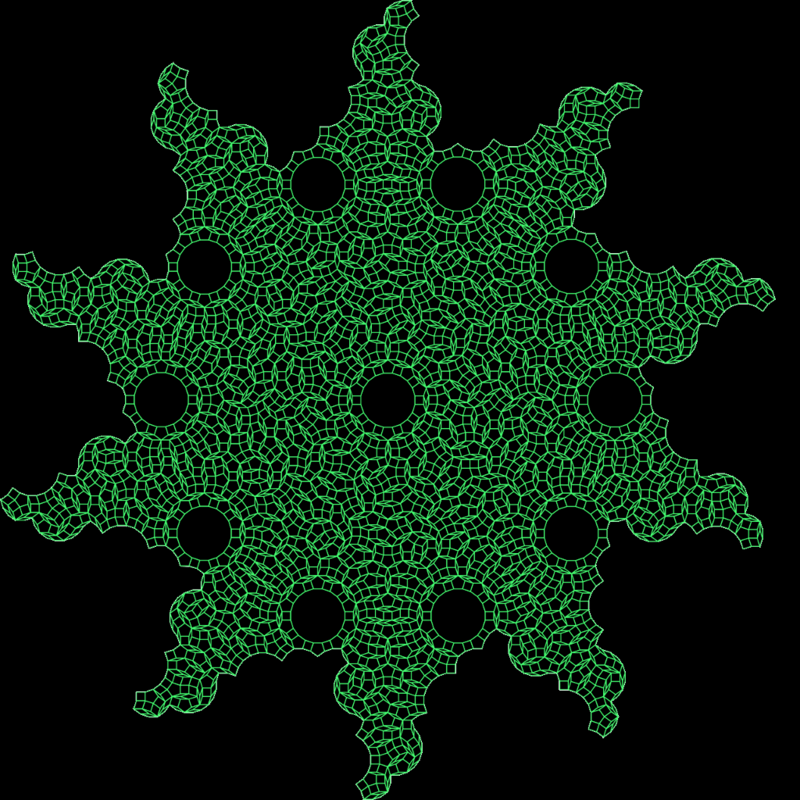 The patch has 2-fold rotational symmetry and neatly divides into identical upper and lower halves, separated by a large convex polygon (a watermelon shape) with 4 20-rhomb bites taken out of it. It's worth taking a closer look at this, so above is the top half of the patch rotated sideways and split into the many jewel-like shapes that it seems built from. The patch has a peculiar mix of order and chaos. 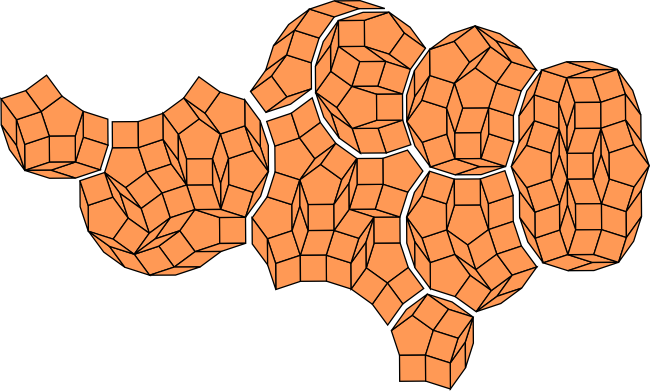 It seems to be composed partially of large convex polygons with small bites taken out of them, but other parts are more extended and irregular. 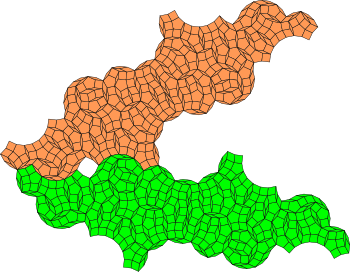 Combining two of the orange patches patches together leaves a small hole in between, which can be filled using one of the small red or maroon patches described in Constructing a thin 4.5.20 tiling. These small 4-fold patches look like an inflated square. I've coloured one of the patches green in the illustration below so that you can more clearly see how they fit together. Like the thin rhomb itself, ten copies of the orange patch will fit together around a common point. In the case of the orange patch, this leaves gaps that can be filled in by 4.5.20 roses and the small inflated square patch. While not a full plane tiling, the result is so beautiful that I have provided larger 1024x1024 and 1280x128 versions below as the image might make an interesting computer wallpaper.